Stocks on Wall Street meandered in and out of positive territory after a two-day plunge caused by news that the Federal Reserve was getting ready to wind down its massive bond-buying program by mid-2014. Markets were calmer Friday. The Dow Jones industrial average rose 41 points to close at 14,799, but ended down roughly 2 percent for the week. The Standard & Poor's 500 gained 4 points to finish at 1,592 points, while the Nasaq composite ended at 3,357 points, down 7 points. The Dow plunged 560 points Wednesday through Thursday, wiping out its gains from May and June. The Fed's easy money policies have been a big driver behind the stock market's bull run the last four years. 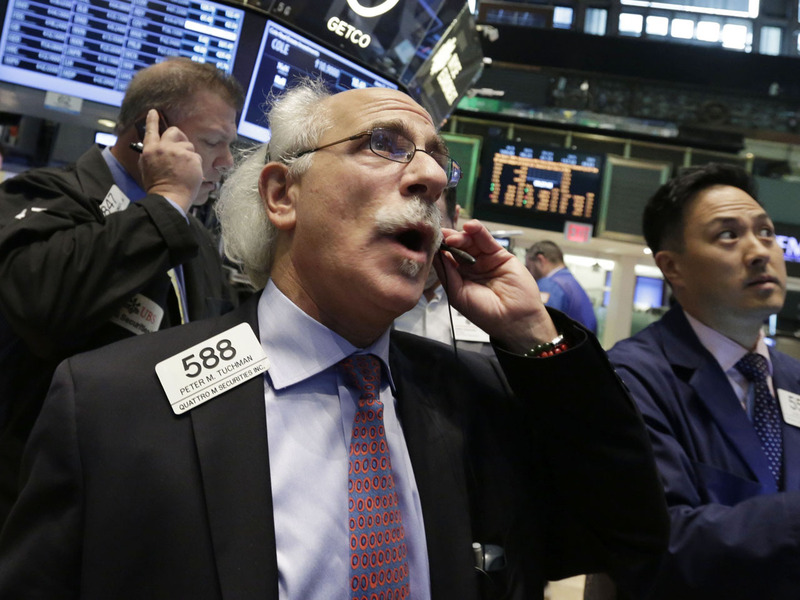 The plunge came just three weeks after the Dow hit a record high of 15,409. The Standard & Poor's 500 index was up 5 points to 1,593. It had been as much as 10 points lower earlier in the session. The S&P hit its own record high a month ago. Technology shares continued to feel pressure after business software maker Oracle reported disappointing earnings late Thursday. Oracle is struggling to adapt as customers shift away from software installed on their own computers toward software that runs remotely. Kim Forrest, senior analyst with Fort Pitt Capital Group, a portfolio management firm in Pittsburgh, said the market had the "right reaction" to the news that the Fed would wind down its stimulus if the economy continues to improve, but the move may have been overblown. "We're getting news that made the market uncomfortable," she said. "We shouldn't be sitting at these highs given the fact that the Fed signaled that someday it's going to take some liquidity off the table. So the reaction is right, the magnitude is probably a little off." The yield on the 10-year Treasury note rose to 2.49 percent from 2.42 percent late Thursday. The yield has risen sharply since Wednesday as investors sold bonds in anticipation that the Fed would slow, and eventually end, its bond purchases. The yield, which is a benchmark for interest rates on many kinds of loans including home mortgages, is at its highest level since August 2011. On Tuesday, the day before the Fed's announcement, it was 2.19 percent. It hit a low for the year of 1.63 percent on May 3. The price of gold recovered after plunging the day before. Gold was up $6.40, or 0.5 percent, to $1,292.40 an ounce. Crude oil fell $1.15, or 1.2 percent, to $94 a barrel in New York. A Fed policy statement and comments from Fed Chairman Ben Bernanke started the selling in stocks, bonds and commodities Wednesday. Bernanke said the Fed expects to scale back its bond-buying program later this year and end it by mid-2014 if the economy continues to improve. The bank has been buying $85 billion a month in Treasury and mortgage bonds, which has made borrowing cheap for consumers and businesses. The program has also encouraged investors to buy stocks instead of bonds. The S&P 500 is still up 11.9 percent, for the year, not far from its full-year increase of 13.4 percent last year. Overseas, Japan's Nikkei index rose 1.7 percent, but other Asian markets fell. European markets slipped. France's CAC-40 fell 0.3 percent and Germany's DAX fell 0.9 percent.